Company continues its pairing of sportiness and comfort in this sedan. Mazda is staying the midsize sedan game and its latest iteration of the Mazda6 is one of the better options. Sedans have fallen out of favor with motorists in the United States sales tallies suggest. Ford Motor Co. and Fiat Chrysler Automobile N.V. indicate, with the exception of muscle cars, they are prepared to exit the segment, perhaps for good. But the midsize sedan segment remains one of the largest in the business; accounting for sales of more than an estimated 1.5 million units and drawing interest from key manufacturers such Toyota, Honda, Hyundai and Mazda, specifically with its Mazda6. 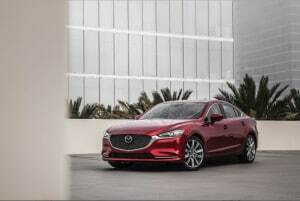 Mazda has made a substantial effort to re-engineer its midsized sedan for 2018 and while its predecessor was awfully good, the 2018 Mazda6 with its retuned suspension, quieter cabin and revamped connectivity, has been made even better. The brass at Mazda always likes to talk about how they want to surprise customers by offering a vehicle that for all practical purposes is a “class above” and the Mazda6 certainly delivers with a well-furnished cabin. 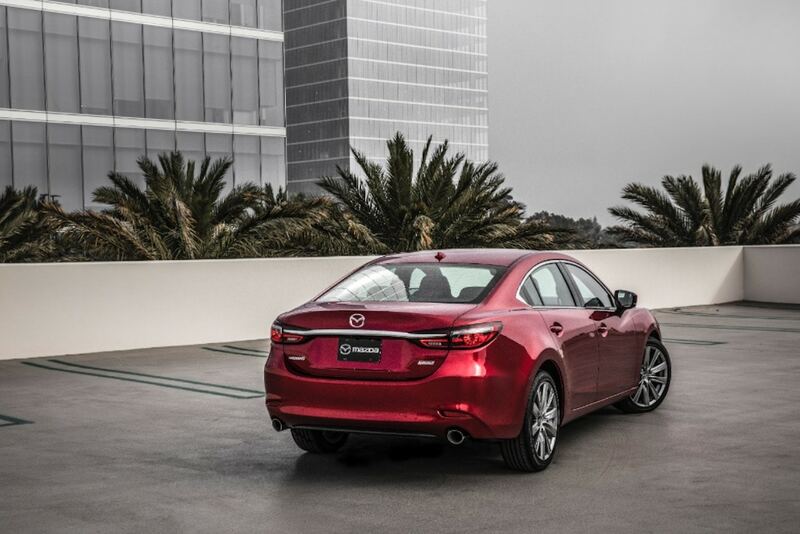 With a contemporary exterior look and sporty engine, Mazda has the right mix for a successful midsize sedan. The instrument panel is very simple and straightforward, reaching key knobs and controls is the same. Meanwhile, the instrument cluster itself is well thought out and easy to read, including the tachometer, which seems to get lost in a lot of vehicles these days. Mazda says it wants to build cars that appeal to people for whom driving is a fun, so details such as the easy-to-read tachometer and the uncluttered cabin come into play. In keeping with Mazda’s basic philosophy of building cars for drivers with a capital “D,” the Mazda6 also has some impressive driving dynamics. It boasts crisp steering, ample braking power and a well-balanced and supple suspension. 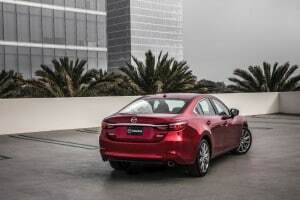 Even if you take a curve or a corner at higher that recommended speeds the cars reacts the Mazda6 manages without any fuss or screeching tires as it easily maintains its equilibrium. The power in the Mazda comes from the SkyActiv 2.5-liter, dual-overhead cam 4-cylinder engine that on the Signature version that I was able to test also had a “dynamic pressure” turbo, which never ever seemed to lag. 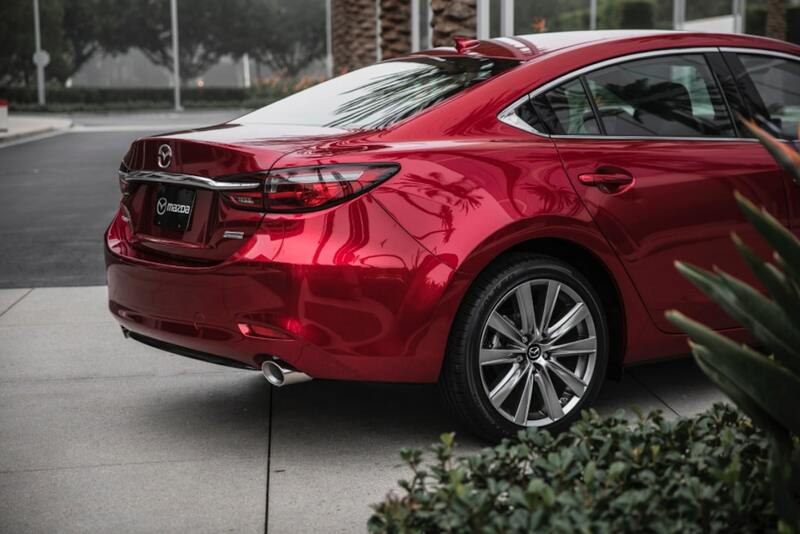 The new Mazda6 offers plenty of room and comfort for passengers in both the front and rear. 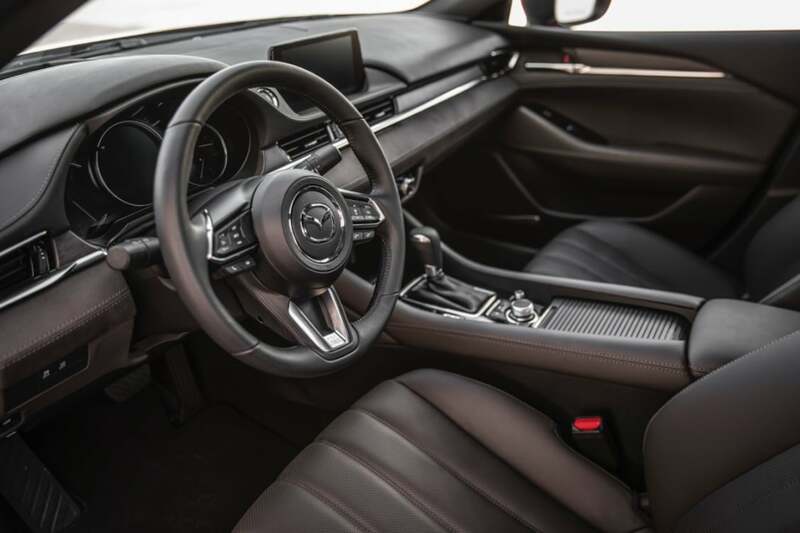 Mazda hasn’t abandoned the manual transmission and produces some of the best in business and a manual transmission is available on the Mazda6. But the Mazda6 sedan that I drove was equipped automatic transmission with a start-stop function. It took a short time to get used to the automatic’s shift patterns but it functioned nicely and the powertrain certainly reacted effortlessly. The powertrain produces 227 horsepower and 310 foot-pounds of torque. The extra torque gives the Mazda6 the ability to roar away from a standing start quickly as I discovered on a freeway trip where I found that I had moved well past the speed limit recommended by the State of Michigan. Needless to say, the Mazda6’s ability to move out in traffic raises its fun quotient. But the Mazda6 also is equipped with cylinder deactivation to help save fuel and the version I drove got 23 miles per gallon in city driving and 31 mpg on the highway for a combined rating of 26 mpg. The other relevant numbers include the price of $36,140, including the $890 destination charge. The interior of the Mazda 6 is simple and straightforward. I suspect one of the reasons motorists began drifting away from the midsized sedan segment was too many boring designs. But the Mazda6 has very nice exterior lines with its tasteful front fascia and rear and strong profile that makes the car’s overall exterior design very appealing. The exterior appeal has been enhanced on this year’s model with the addition of LED headlamps and daytime running lights. Seventeen-inch wheels are standard now and 19-inch wheels are available. As I noted earlier the cabin is quiet and nicely furnished. Visibility from the driver’s seat is excellent and the interior lighting scheme used on the instrument cluster and center stack works effectively at night, making driving in the dark less stressful. The Mazda6 also is available with driver assistance features such as a Smart Brake Support System with forward collision warning, lane departure warning, blind-spot monitor and radar cruise control with stop and go feature and cross-traffic alert. A 360-degree view monitor with front and rear sensors is also available on the Mazda6. The combination of Mazda’s craftsmanship and design as well its full complement of technology as well as its solid driving dynamics makes you hope the sedan can hand on in changing world. This entry was posted on Tuesday, November 6th, 2018 at and is filed under Automakers, Automobiles, First Drive, Fuel Economy, Markets, Mazda, Reviews, Sales, Sedans, Trends, U.S./North America. You can follow any responses to this entry through the RSS 2.0 feed. Both comments and pings are currently closed.